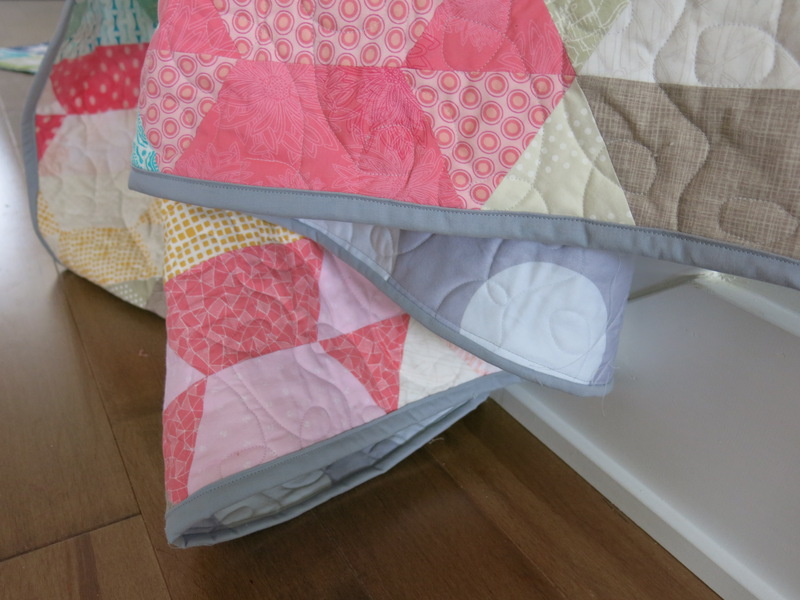 With a new addition to the family, there was a need for a new quilt! Since I’ve recently moved to a more rural area, the other quiltuplets decided to make a farm-themed baby blanket. It’s simple, adorable and I love it! It features a pieced barn block in the centre, with churn dash blocks in the corners. The fabrics feature farm animals and fruit. With Christmas coming up, I have a few project that I’m frantically trying to finish. I hope to be able to share them soon! More than 4 years after deciding to make a quilt together, B and I have finally finished! Since starting the quilt, degrees have been finished (and almost finished), babies born, new jobs started and new homes bought. 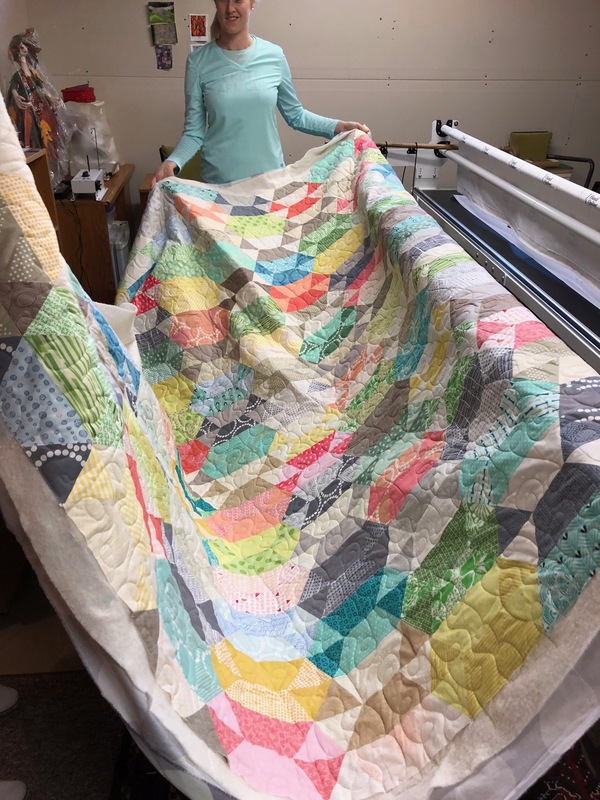 Making this quilt has been quite the journey, so I’m excited to share the final result! The finished top: ironed and ready to quilt! Unloading the quilt from the longarm machine. And finally: the finished product! I tried machine stitching the binding for the first time. I’m quite pleased with how it turned out and how much faster it was to complete! As soon as B got home, she put it on her bed and sent a picture. I love how fresh and bright it looks! I recently started the Gathering Mystery quilt at Cora’s Quilts. I used this opportunity to buy some more fabric! I decided use all Kaffe Fassett Collective, since I love the patterns but have never used only those fabrics in a quilt. Hyggeligt Fabrics has a great selection for those looking to order from a Canadian store! I cut all the pieces, and have completed the clues for week 2 and 3. I love how the colours are coming together and can’t wait to share the next weeks! I love mini charm packs! They are an inexpensive way to play with all the fabrics of a collection. I’ve started accumulating a little pile, so I’m experimenting with mini quilts as a way to use them. I’ve also completed my first mini-quilt of this series. It’s not a new project (UFO #14) and the binding was sitting with a few inches to go for months. I started with a mini pack of Carolyn Friedlander’s Doe collection. 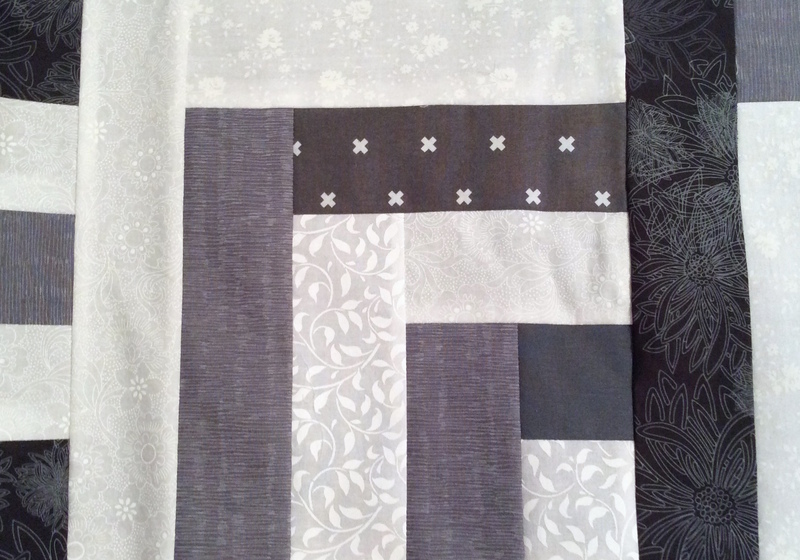 After getting a layout I liked, I sewed pairs of squares to make rectangular four-patches. Even though it’s a simple design, I like how it turned out! I have been meaning to post for awhile, but didn’t realize how long it’s been until I went to make a post and realized I’d forgotten my password. Oops! So with a new year, and a fresh start, I am once again making a resolution to post more frequently. By more frequently I mean once per month, but I’d like to eventually get new content on our blog weekly. Without further ado, here is the update on my unfinished projects! I finished two projects, the rag quilt and placemats for a friend. I want to say I hated making the rag quilt. Making all those little cuts was tedious and hurt my hand, and all for a quilt that’s supposed to look like it’s made from rags! The other project I finished was a set of placemats for a friend who got married. I did quilt-as-you-go for each one and chose bright coloured fabrics to complement my friend’s very cheery personality. To give the gift, I got inspiration from a jelly roll and use a simple white ribbon to show off the colours of the mats. I’m happy to have finished these projects – now on to the other 30!!! p.s. I wish everyone a happy 2017, and the best of wishes in getting to those UFOs! Started a few years and intended for a Modern Quilt Guild Challenge, this one is on my design wall and close to being finished. I wanted to try a lone star quilt, and this gave me a great opportunity to try! Excited after learning about curves at a quilt guild meeting, I decided to used a set of blue and green solids to make this curvy quilt. I love foundation paper piecing! I also wanted to design my own quilt. This is the result of those two thoughts. 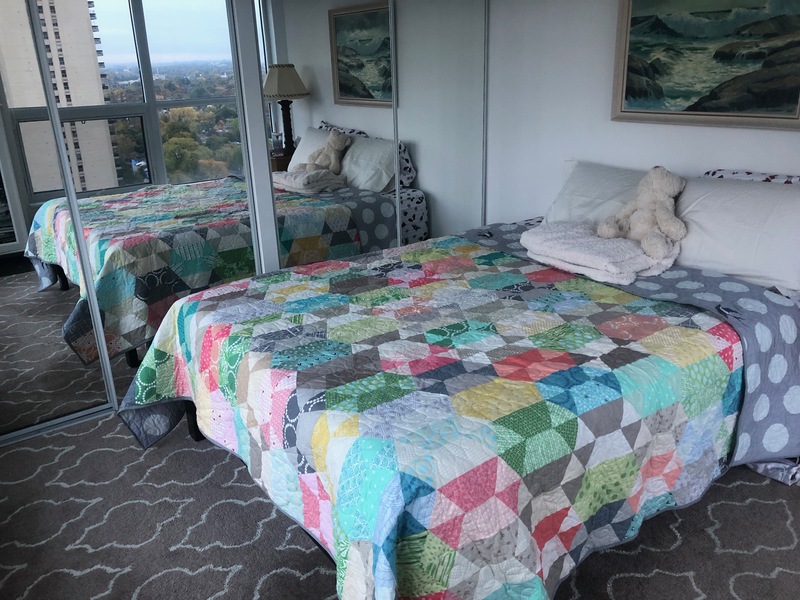 I love the idea of kaleidoscope quilts! So I started one and realized that I probably didn’t choose the greatest fabric for it. But I hope to salvage it! I wanted a new quilt for my bed. I wanted to make something for the baby. She’s almost one, so I will hopefully finish soon so it will actually have a chance to hang in her room! I wanted to try a project that I could take anywhere with me. 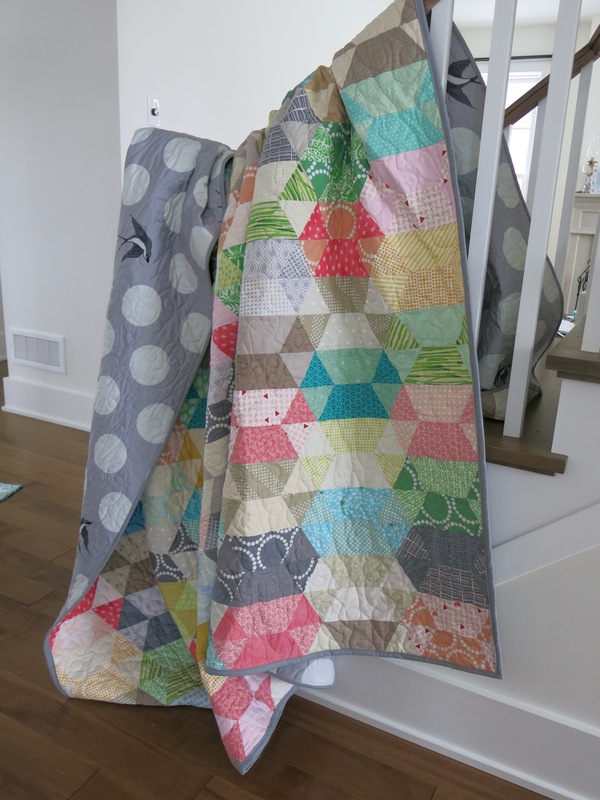 This hexie quilt fit the bill! Here it is all-basted, mid-quilting. Since it was pieced by hand I wanted to quilt it by hand as well. I have tons of scraps and wanted to use them! Especially the pieces that are too small or weirdly shaped to keep for other projects. Boy, was this one a challenge! I was close to finishing it for the deadline, but just had too much schoolwork and had to give up before the end. Inspired by a block swap at the quilt guild. I love the bright colours! I joined a mini-quilt club. This is the first of six; I haven’t started the other five. This one was nearly completed in an afternoon from a mini-charm pack. Only a few inches of binding left! This is a quilt I started awhile ago (I want to say 10 years?). I finally quilted it and now all that remains is the binding. I’m never doing one of these again. All I have left is clipping the edges, but it is so tedious and hurts my hand. I loved the pattern and I had a vision of the final product. But as it came together… the colours I chose didn’t end up as expected. And the number of points to piece together accurately became a chore as I realized how much I disliked the colour choices. My sister, mum and I all did a block of the month with our own colour choices. This was started a few years ago and none of us has finished. All that is left on mine is the binding! The piecing was ok, but the quilting didn’t turn out so well. It’s small and almost done so I might as well finish it. I had two layer cakes and a pattern! But my momentum slowed after some botched quilting. A finished top for a lap blanket – ready to quilt! I did the Aiming for Accuracy quilt-along and use the extra fabric to start piecing the back (shown here in a messy pile). I wanted to try some applique. I cut the pieces using the template for the challenge. I got a few blocks done, but not by the deadline. This was only started a few weeks ago. I had guests at my friend’s baby shower decorate squares for a quilt. This is my piece to work on this round for the round robin! Technically, this isn’t my unfinished project. 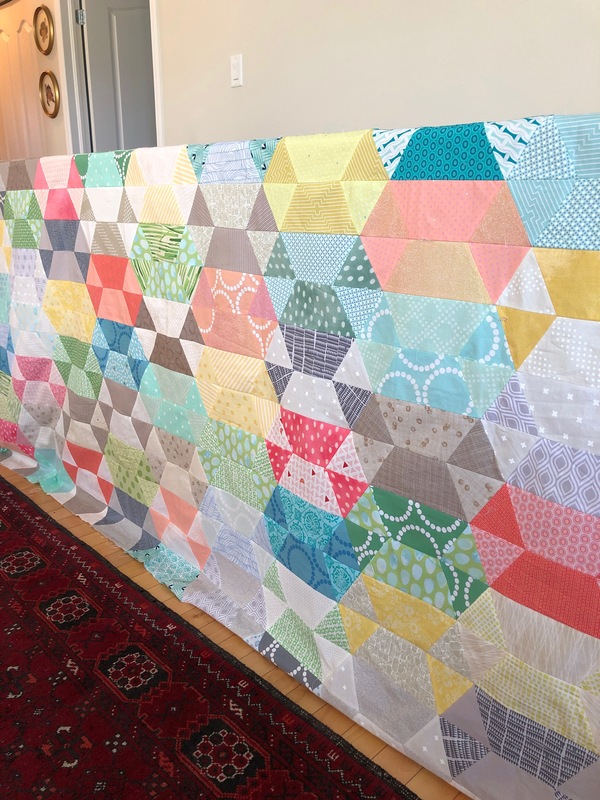 I’m helping a friend make her very first quilt! But, it sits in my sewing room so I include it on my list. This is a gift for my friend. A wedding gift. She was married nearly a year ago, but I only have a few inches of binding left! I had a couple of layer cakes and wanted to design my own pattern. These are the leftover blocks from my first quilt, started 15 years ago. This top is close to being done but I had some problems with the border and it needs fixing before being quilted. So, there you have it! My list of unfinished quilts is a LOT longer than I expected and I admit to being a bit embarrassed about it. I will challenge myself to finish not one but two quilts before starting a new one. I hope to be down to single digits by 2025! p.s. My mum just reminded me about one more quilt! Gift that sister and I have been working on. Close to completion!